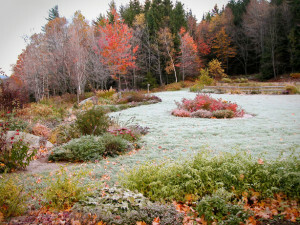 Winter offers a multiplicity of moods: sunny days; cloudy days; mornings when a gentle hoar frost delineates each garden bed and traces every twig; and weeks when deep snow obliterates everything on the ground. Winter also comes in slowly. In November and December paths and steps are still quite visible through the shallow snow, and very much part of the picture. 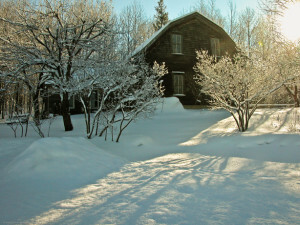 But in January’s deeper snow, all traces of garden walls and smaller shrubs disappear. Typically in our garden snow will cover the ground for a full four months, with the greatest depth coming in January, February and especially March. Very occasionally we will have no snow at all: this is called an open winter. 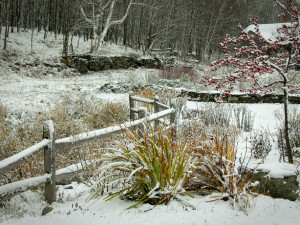 But at lower elevations, such as near Lake Champlain, a winter with very little snow is almost a routine occurrence. And of course winter, like any other season, is not all light and beauty. Sometimes falling snow completely hides even the nearby mountains. And in late December, when the daylight hours are at their minimum, everything indeed seems gray and bleak. Then surely ‘mud season’ is the ugliest time of all, a brief time to be endured by everyone who lives on a dirt road in the country. This is when the snow pulls back and the land turns to shades of brown, and yet we know there are many weeks to go before the grass turns green and the flowers return. But the bleak times seem quickly forgotten with the crisp sunny days of January and February. 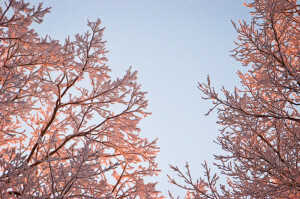 After every snowfall the sun re-appears and each twig of every tree is decorated in white. And late in the day the sun sheds a pink glow over the garden and woods behind. I feel it is up to us to wholeheartedly enjoy this beauty, as and when it is offered. Winter by no means a singular season. 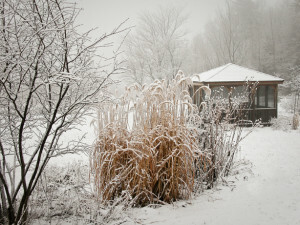 The scene changes from month to month and even from day to day, as these pictures of our garden taken through a single winter show. Most of the leaves are gone from the trees by now, but the flowers on the Hydrangea ‘Tardiva’ have turned a luscious dusty pink, and the leaves on the service berries and blueberries are crimson-red. Then in a single night there was a dramatic mid-winter thaw. With the snow temporarily gone, the clumps of blue oat grass, Helictotrichon sempervirens, stand out against nearby dwarf evergreens, and behind the seed heads of Sedum ‘Autumn Joy’ and Chrysanthemum ‘Mary Stoker’ are still unscathed. After a few days of enjoying the sight of the low growing grasses and perennials, the snow returned and was with us till the end of March. Some years we may be dealing with three feet of snow on the ground, with snow approaching the window sills, whereas other years there is next to none. 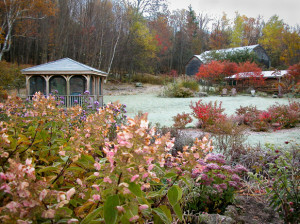 So I make my garden plans anticipating a typical winter of a foot or so of snow. ….And winters vary from place to place. One year I remember when, from January to March, our garden was completely snow-covered. But in the valley, just ten miles from here, the fields were brown all winter long. 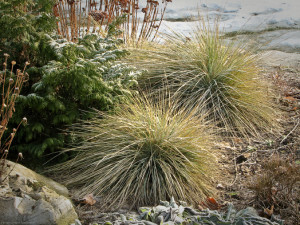 So if winters in your garden tend toward the snow-less, you can experiment with smaller plants like Blue Oat Grass (as in the picture above) that look interesting against bare ground in January. 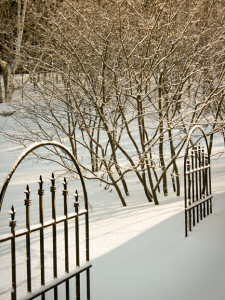 If, on the other hand, you regularly see a foot or more of snow for many months at a time, you will want your winter garden to feature trees and larger shrubs, as well as garden structures, all of which will show in the snow. More about this in A Show-in-the-Snow Garden.